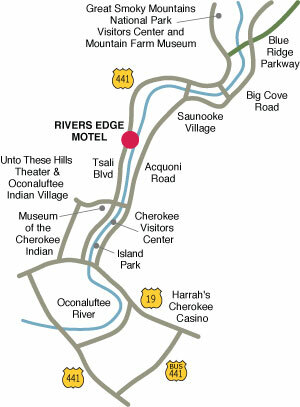 Located in the heart of the Great Smoky Mountains, River’s Edge Motel has everything to offer. You can relax on your own private balcony overlooking the Oconaluftee River, or just step out the door to choose from convenient restaurants, stores, trout fishing and attractions. Our Cherokee NC lodging is near all the great things to do in Cherokee, and easy day trips to Gatlinburg, Pigeon Forge, Cades Cove and Asheville. Rivers Edge Motel is on Tsali Boulevard (US 441) midway between the Cherokee Historical District and the Sanooke Village shopping area; and just a half-mile from the Great Smoky Mountains National Park and the southern terminus of the Blue Ridge Parkway.